North Korean leader Kim Jong Un (left), accompanied by South Korean President Moon Jae In, receives a bouquet from South Korean children residing in a border village. GOYANG, SOUTH KOREA - The world held its breath on Friday (April 27) as the leader of North Korea made a historic crossing into the South for a high-stakes meeting that held the promise of peace on the divided peninsula. Everything about Friday’s inter-Korean summit, the third since the end of Korean War, had been carefully choreographed to the minutest details but a string of off-script moments helped break the ice. Their jam-packed schedule culminated in the signing of a joint declaration to work towards the complete denuclearisation of the Korean Peninsula. Although some experts say the so-called Panmunjom Declaration was lacking in specifics, they say the rapport between North Korea's leader Kim Jong Un, 34, and South Korea's President Moon Jae In, 65, will pave the way for closer collaboration in the long road towards permanent peace. They looked relaxed and clearly at ease around each other even though it was their first meeting. Mr Kim, dressed in his black trademark Mao suit, said he was “flooded with emotion” when he crossed the Military Demarcation Line (MDL), the de facto border that divides the two Koreas, at 9.30am (Seoul time). He is the first North Korean leader to set foot on South Korean soil. Walking across the cement blocks that mark the border was “so easy”, Mr Kim said, making him wonder “why it took so long to do so after 11 years”, referring to the last summit in Pyongyang in 2007. At the time, his South Korean host, Mr Moon, was then President Roh Moo Hyun’s chief of staff and head of the summit preparation committee. The two leaders shared a handshake for 22 seconds, before Mr Kim held hands with Mr Moon and invited the South Korean leader to cross the Military Demarcation Line (MDL), or the de facto border, into the North Korean side. Cheers erupted from officials and reporters at the scene and at the press centre in Kintex, Ilsan city, when Mr Moon accepted the invitation with a broad smile. Mr Moon briefly crossed the border with Mr Kim before they both returned to the South Korean side. Speaking to Mr Kim at their summit venue, the Peace House, Mr Moon said: "The MDL is no longer a symbol of division but a symbol of peace. I would like to pay tribute to the courageous decision made by you - you have made a bold and courageous decision, so why don't we make the bold and courageous decision to amicably discuss peace, to once again give a great gift to the whole humankind by achieving peace." In the morning session of their summit, high-powered delegation from both Koreas had 100 minutes of “serious and honest” discussions on denuclearisation and the establishment of permanent peace at the Peace House in the United Nation-administered truce village of Panmunjom. Before the start of the morning session, both men vowed to "write a new chapter" in ties as they began historic summit talks on Friday (April 27) morning amid hopes of rapprochement on the divided peninsula. In comments broadcast live to millions worldwide, Mr Kim said:"This will be a new starting point for us, we will make a new beginning, and it is with such commitment that I have come to the meeting." Vowing to take a future-oriented approach, Mr Kim said: "Through today's meeting, I hope we won't go back to square one again, and the non-implementation of what is committed will not happen again." Mr Moon, in turn, said that inter-Korea ties were at the "peak of spring" and that the entire world was paying attention to developments on the Korean peninsula. "I believe our encounter is extremely important for all of us, and that means a huge burden on our shoulders." "I guess we have ample time. We can discuss the whole day; over the past seven decades we couldn't really communicate... Definitely we can talk the whole day," Mr Moon said. 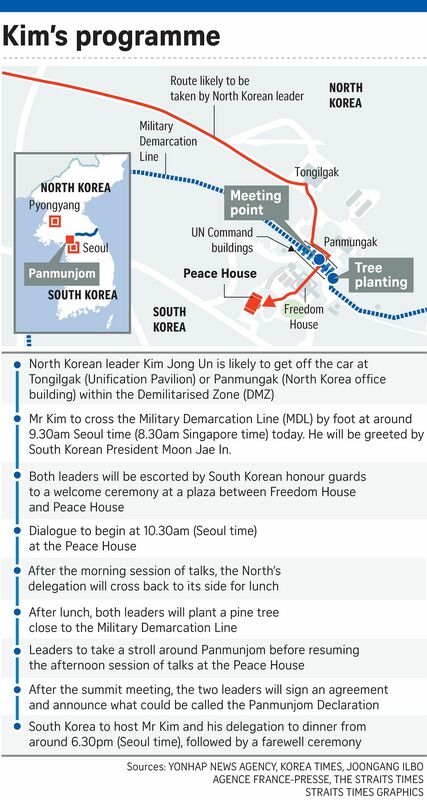 They broke for lunch after the morning session and Mr Kim returned to the North for lunch and returned to the South at around 4.30pm (Seoul time) for a tree planting ceremony which was laden with symbolism. The two leaders selected a pine tree sown in 1953 to symbolise the year the armistice was signed. They used soil collected from Mount Halla in the South and Mount Baekdu in the North and water from the South's Han River and the North's Daedong River. After the tree-planting ceremony, the two leaders took a stroll around the Joint Security Area. Live TV footage showed the two men chatting and clearly at ease around each other as they walked towards a footbridge in the area. Photographers were told to leave the leaders as they settled down at a table on the footbridge for a private one-on-one chat that lasted 30 minutes. Friday's scenes of the leaders of the two Koreas walking and laughing together marked a striking contrast to last year’s barrage of North Korean missile tests and its largest ever nuclear test that led to fears of an armed conflict on the Korean peninsula. Mr Kim told Mr Moon during their talks:"I heard that you didn't sleep very well because you had to take part in National Security Council (NSC) meetings... I will make sure I won't interrupt your morning sleep any more." The NSC meetings are convened whenever Pyongyang conducts missile and nuclear tests missiles. Commentators say the body language of the two leaders show that they seem at ease with each other. Before starting the talks, the North Korean leader surprised many watching the historic event on live television by making what appeared to be an impromptu suggestion for a group photo with Mr Moon and all their accompanying delegates, reported Yonhap. Friday's meeting marks only the third one between leaders of the two Koreas - and the first in South Korea - following summits in Pyongyang in 2000 and 2007. In a statement issued after Mr Kim made the historic crossing at the MDL, the White House voiced hope that the inter-Korea summit would "achieve progress towards a future of peace". "We are hopeful that talks will achieve progress towards a future of peace and prosperity for the entire Korean peninsula," the White House said. "The United States appreciates the close coordination with our ally, the Republic of Korea, and looks forward to continuing robust discussions in preparation for the planned meeting between President Donald J. Trump and Kim Jong Un in the coming weeks." The Korean War technically has not ended; a ceasefire deal struck in 1953 was never replaced with a peace treaty. The two Koreas are divided by the heavily fortified Demilitarised Zone (DMZ), a 4km-wide strip that stretches 248km from coast to coast. Mr Kim's delegation includes his sister Kim Yo Jong and eight other delegates, including Foreign Minister Ri Yong Ho and nominal head of state Kim Yong Nam. Mr Kim Yong Nam was present at the first and second inter-Korea summits. Throughout the day's events, Mr Kim's sister was close by his side. She was the one who handed Mr Kim his pen when he wrote in a guestbook at the Peace House summit venue. The message read "A new history begins now – at the starting point of history and the era of peace." After Mr Kim crossed the MDL, which divides the two Koreas, Mr Kim and Mr Moon were handed flowers by a South Korean boy and girl, pupils of an elementary school situated in the South's border town of Daeseong-dong, which is the only South Korean village within the DMZ. The Presidential Blue House said the welcoming by the children symbolised the start of a new era and that other leaders, including US President Trump, have previously been welcomed by children. An official from the Blue House recounted an exchange between a South Korean journalist and his North Korean counterpart. The two leaders inspected the South's honour guard before beginning their talks at the Peace House in Panmunjom, a truce village on the southern part of the DMZ. This makes Mr Kim the first North Korean leader to inspect a South Korean military honour guard. Following a long day of talks, both leaders and their delegations had a dinner banquet. On the menu is Swiss rosti with a Korean twist - the fried potato dish having been chosen as a homage to Mr Kim's childhood, which he spent in Switzerland. Baked John Dory, made with flat sea fish from the port city of Busan where Mr Moon grew up, will also be served. After dinner and a farewell ceremony, which saw the two men handing hands while the finale song was being played, Mr Kim and his entourage left Panmunjom for Pyongyang at around 9.30pm (Seoul time).